The Providence Phoenix was a Providence alternative newspaper that’s now defunct. It was in what I’d call the “alternative lite” category, definitely having some stuff you wouldn’t see in a more “official” newspaper like the Providence Journal, but also non-offensive enough to be in most businesses around town. To be honest, I think it was a pretty good representation of Providence as a whole. I wouldn’t say I ever intentionally really read it, but on more than a few occasions I would be waiting somewhere or getting a quick slice of pizza alone (shoutout to Fellini’s for keeping my arteries clogged), and just pick up a copy (it was free) to see what was going on around town. 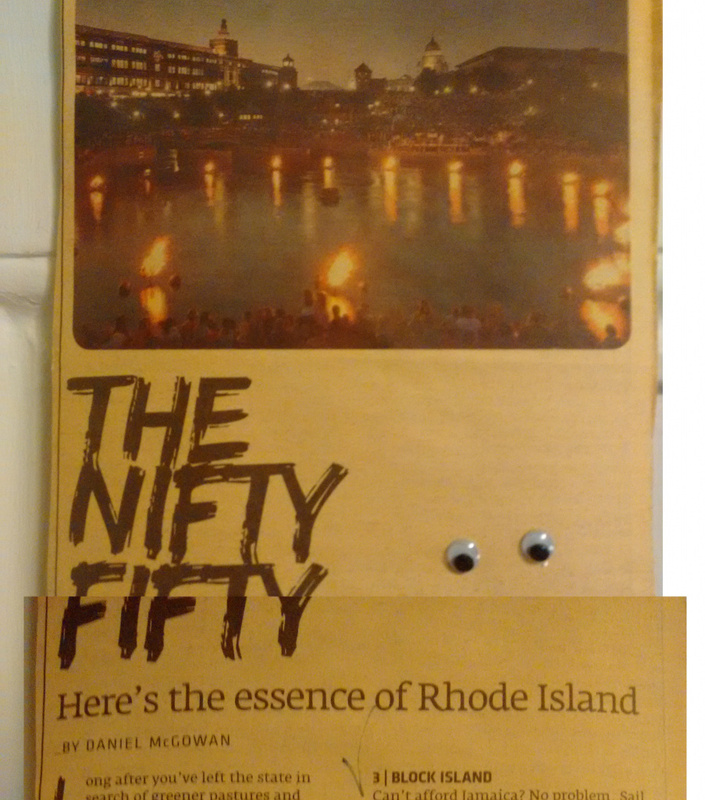 Anyway, one of these times, when I was very new to Providence, I opened it up and found the “nifty fifty” — 50 things you “have to” do before you leave RI. Or, the sub-headline of it: “Here’s the essence of Rhode Island” (remember this line in a bit). Seeing that I’m soon leaving RI (…and currently have only one blog post), I thought I’d write a mini review of both the list and the places on it. So, about the list itself. First, it’s not meant to be entirely serious. As you’ll see, several of the entries are jokes. To be honest, I’d rather have another cool RI thing I could check out than a kind of lame joke that will quickly be a dated cultural reference no one will get (I’m looking at you, number 13), but… this brings me to my second point. There’s a decent chance they have the jokes for the same reason they have a few entries that aren’t actually in RI or are just kind of generic things that could really be connected to anywhere else: they started running out of them. As much as I’ve waxed poetic about the simple joys of RI life, it really is a small and quiet place for the most part and 50 is actually a bigger number than you might think. So I suspect they bit off a bit more than they could chew and had to add a bit of fluff. Therefore, there are a few entries that my friends and I did where… it just didn’t seem especially like the “essence of RI”. For example, it would be a restaurant or business that native RI/PVD’ers I talked to hadn’t really heard of, making me wonder if they got some sort of kickback for including certain businesses in their list, which, funnily enough, would be very much the essence of RI…maybe that was a hidden message we were supposed to get??!? Anyway, here we go. Below is an image stitched together (beware, about 15MB) from the very old, yellowed newspaper clipping (it’s about 4 feet long), and below that, my quick review of each thing. I’ll write most of it in black font, assuming I’ve done them, in red if I haven’t, and in green if it’s a thing that’s not really possible to do. Attend Waterfire: Easy! One of the first things to do during your first summer in PVD. It’s kind of a clown car in terms of the crowds, but my friends and I have always said that we’re impressed by how tasteful it is. Good job RI. Scarborough Beach: Damn, gotta get out there. Block Island: Mixed feelings. The place is very pretty and I’ve had some great times there, and the ferry ride is fun. But, it’s also really commercialized and doesn’t really have an economy outside of tourist season. Take RIPTA: I mean… I have, but I wouldn’t exactly call it the jewel of RI. #4 and you’re already suggesting essentially “ride the bus”? Not good, Phoenix. Present at Pecha Kucha: Well I’ll be damned. I was pretty sure that it was over, but the site is kind of a mess and under “latest events” it has one in 2013, but it seems like they’re still happening… maybe I can make it to one before I leave! See a play at Trinity Rep Theater: Damn, another easy one I haven’t done! Try out for Providence Roller Derby: Considering it’s ladies only (as it says) and it’s kind of an in depth thing, I’m gonna chalk this one up to a joke. However, I did actually go to my first roller derby game recently! Independence Trail: How have I not done this?!? This is the easiest possible thing. I mean I’ve probably walked to all the spots independently, but I can’t say I’ve actually done the trail. Hot damn, I’m gonna do this one soon. Newport Cliff Walk: The mansions you can kinda see from it are cool, but they’re right in saying that the views of the water are way prettier. Solid choice. Play Bocce on Federal Hill: Sigh… this is another joke one in my opinion. I’ve never actually seen old Italian men playing Bocce on Federal Hill, and it’s not really a thing to go up to them and ask to join in, if they were. Find Pauly D: He apparently lived in Johnston at some point. Still, super lame joke. Swan Point Cemetery: Really pretty and peaceful, and some reaaaally old gravestones. What’s kind of cool is that you can see a ton of gravestones from old RI families that lots of streets and buildings around Brown were named after. The Hot Club: I honestly have no idea what this is doing here. I’ve gone a bunch of times and… it’s just a bar. A pretty normal, fairly bro-y bar. Maybe it was something really different at some point? It’s nice that it’s on the water, anyway. Edd Pedro’s annual wiffleball tournament: I haven’t done this, partly because it’s only once a year, and also because I don’t think I could convince enough friends to pay $40 each to play some wiffleball. Womp womp. Kind of a bad entry IMO; is this really that related to RI? Newport Mansions: Damn, I should do this. The thing is, every time I’ve been in Newport, my friends and I have wanted to spend it on the beach or other stuff. Pride weekend: Damn, I’ve heard this is really fun in PVD! These once-a-year events are killing me. Depasquale square: It’s…nice. IMO the food I’ve gotten there has always been reaaally overpriced, and it’s kind of a trashy/raucous area. Olneyville NY System: I actually like the RI wiener, which is a surprise because I’m pretty picky with toppings. It has chili, diced onions, celery salt, and mustard. That said, it’s still a hot dog. Mulligan’s Island: This is a fairly sad little batting cage/driving range/mini golf place. It doesn’t help that it’s literally next door to both a prison and the RI DMV. Also, its mini golf is MAYBE the worst in the world. Everything about its design is awful. Explore the Athaneum: The Athaneum is awesome and probably the East side’s worst kept secret. I get the feeling everyone thinks that only they know about it. The Mews Tavern: Wakefield always struck me as kind of far to go for more beer options, but maybe there’s something special I don’t know about the place. I’ll try to check it out at some point. Pawtucket Red Sox: Somehow never gone! Newport Jazz and Folk Festivals: I’ve gone to the FF, which was pretty cool. They definitely stretch the definition of “folk”, but I guess that happens anyway. Never gone to the jazz one, so I can’t say I’ve done this one fully. Cable Car Cinema: an awesome little place. A small movie theater that plays a lot of indie and foreign movies, and you get to sit on couches and can order tea or beer! Take a walk down Blackstone Boulevard: I mean… it’s just walking by a bunch of expensive houses. I’ve done it, but literally only on the way to other, better places. Party at URI: I’m saying this one’s a joke. Soundsession: As far as I can tell from Googling, this is now defunct. In fact, I think it may have stopped the year I got to PVD. Sakonnet Vineyards: Damn, another relatively easily doable one! Del’s Lemonade: Eaaaaasy. Tbh I don’t understand why this is a thing. It’s like being proud of a 7/11 slushie. It’s just pure lemon flavored sugar. Cellar Stories Bookstore: a cute little place, though I can’t imagine how they stay in business. It put a bit of a damper on my visit when they made me leave my backpack up front… I just don’t think that the used-bookstore crowd is stealing many books, and I think it’s a kind of alienating policy. East Bay Bike path: Ahhh, so many times. Legitimately one of my favorite parts of RI. It leads to several beaches and is just wonderful on a summer day. Old Canteen restaurant: I guess this must have been an old Federal Hill place back in an earlier PVD era? Either way, it was a fun little spot that I wasn’t expecting. This is the type of thing I wanted more of on this list. Haven Brothers: This is a food truck that plopped down in downtown PVD and seems to only serve drunk people. I tried once, basically for the purpose of knocking it off this list and… it is not for me. Slice of chocolate cake from Gregg’s: Okay, the description of this was actually really accurate. Gregg’s is a restaurant that from all outside appearances, looks like a senior center or something, and I’d still bet that the actual food is cafeteria food… but their chocolate cake was truly pretty good, and I’m not a big plain cake guy. Gaspee Days parade: Damn these once a year, out of town things! Iggy’s or Aunt Carrie’s doughboys: I’ve had doughboys (basically fried dough…not sure why this is specifically a RI thing, again), but not from either of these places. Maybe by the end of the summer? Lupo’s: They actually get some pretty big acts there. I’ve personally seen Neon Indian, Gogol Bordello, and Beirut (and I’m still pissed I missed Beach House when they came). However, I’ve heard that not nearly as many bands come through as they used to because the owner is pretty unpleasant and word has gotten around to touring bands. That’s a real shame because it’s probably the biggest venue in PVD that’s not like, a real stage. Providence College basketball: Not yet. Wickford Art Festival: This was a fun little thing. It was essentially a thing where people can pay to get a little tent and table in Wickford, and you walk around and look at art. It was neat, but if I’m honest, 90% of the art were paintings of beaches by stay at home moms/retirees. Not bad per se, just repetitive and not that interesting. A few cool ones though. Newport murder mystery: sounds fun, maybe I’ll do it some day! The Wild Colonial: This is… a bar. I’ve gone to it a handful of times. I’m not sure why it’s on here, to be honest. It’s nice, but basically a typical bar. So tallying it up, as of 8/1/2017, there are 20 I haven’t done that I realistically can (yikes! ), 7 that I’m chalking up to jokes/can’t do, and 23 I have done. There are some that would be pretty easy to do if I ever end up in that part of RI (Narragansett for a while, I don’t go to often), but those once a year ones are killing me. I’ll update this as I do more!